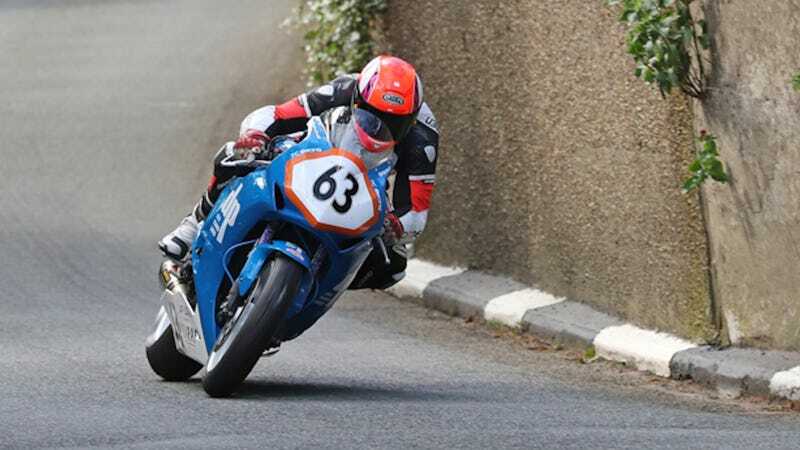 Dutch rider Jochem van den Hoek, 28, died Wednesday morning following a crash on the first lap of the Superstock race at Isle of Man TT, race organizers confirmed in a statement. An average of more than two competitors die each year in the race, and Van den Hoek is the second in 2017. The statement said Van den Hoek crashed at the 11th milestone along the dangerous Snaefell Mountain Course, and that he was treated at the scene. He was with the TC Racing Team for the event, competing on a 1000cc Honda Fireblade for this particular class. Van den Hoek started 36th in the event. Van den Hoek is the second rider to die in this year’s event, after Superbike rider Davey Lambert died in a hospital Tuesday night following a crash on Sunday. The BBC reports that four competitors died in what’s widely regarded as one of the most dangerous races there is in 2016, and the fatality counts vary from year to year: Nine people died in 2005, and six in 2011. The statement said Van den Hoek made his Isle of Man TT debut in 2016, racing several different classes both last year and this one. Van den Hoek finished 44th in his first-ever Superbike TT race in 2016, as well as 34th in the Superstock race and 26th in the Senior TT that year, according to the statement. He got his best Isle of Man finish yet, 27th, in the Superbike race on Sunday, the one in which Lambert sustained fatal injuries.